During our trip to London this summer, we visited Fortnum & Mason, the classic English department store with warrants from Her Majesty the Queen and His Majesty the Prince of Wales. Fortnum and Mason is popular for their afternoon tea, although we did not take tea there, I wanted to show Dave’s mom the store, especially the main floor with a seemingly endless selection of teas, biscuits and candy. 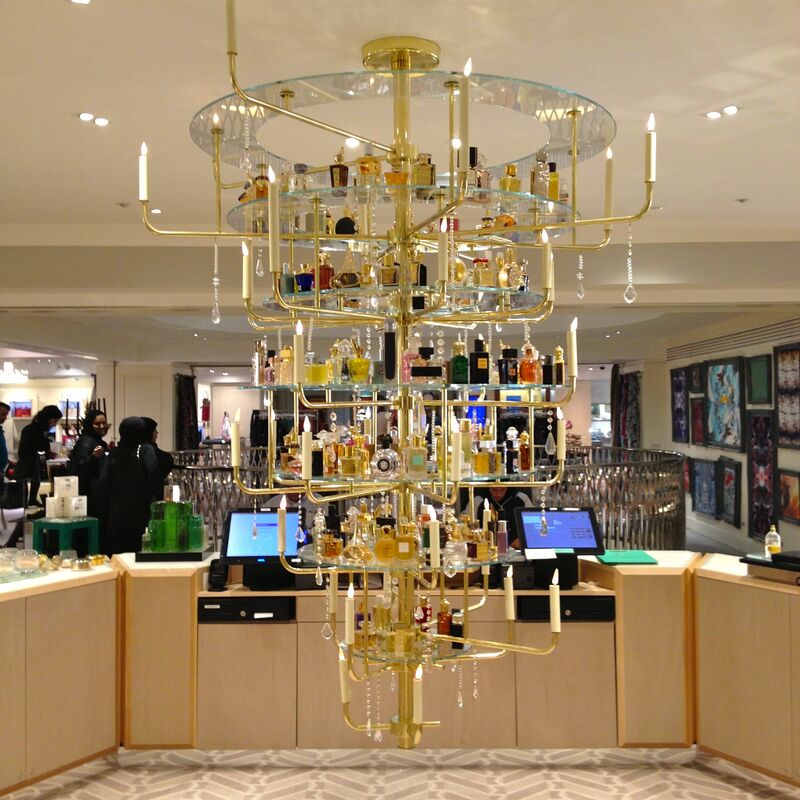 We explored the main floor, then ventured upstairs to the makeup, perfumes and accessories. Perfumes were on display in an upside-down chandelier, which I thought was quite creative. 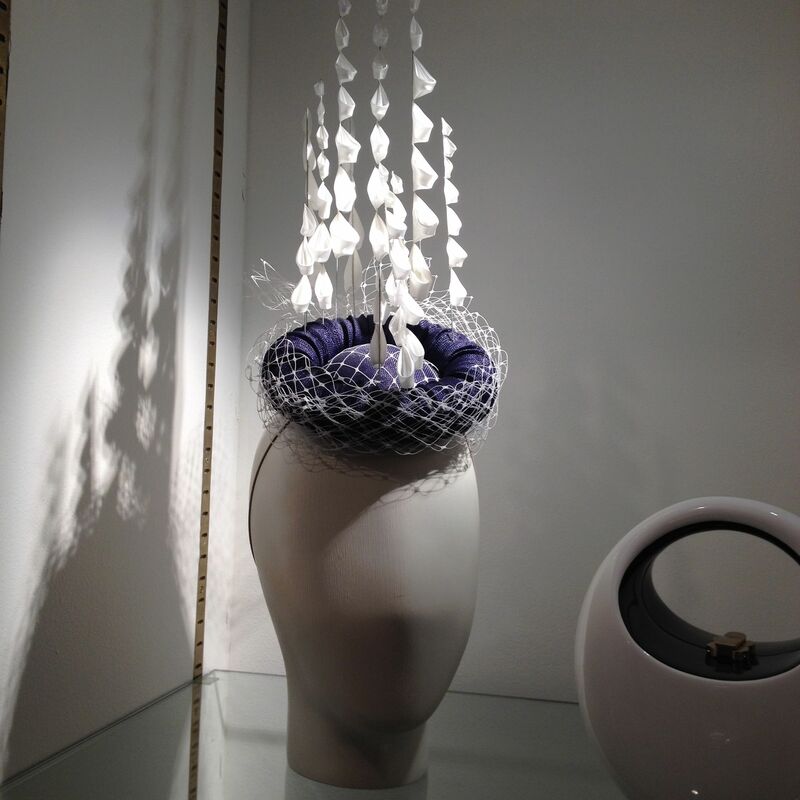 And the hats, or fasteners, were beautiful works of art. I particularly liked the blue one with gold feathers. 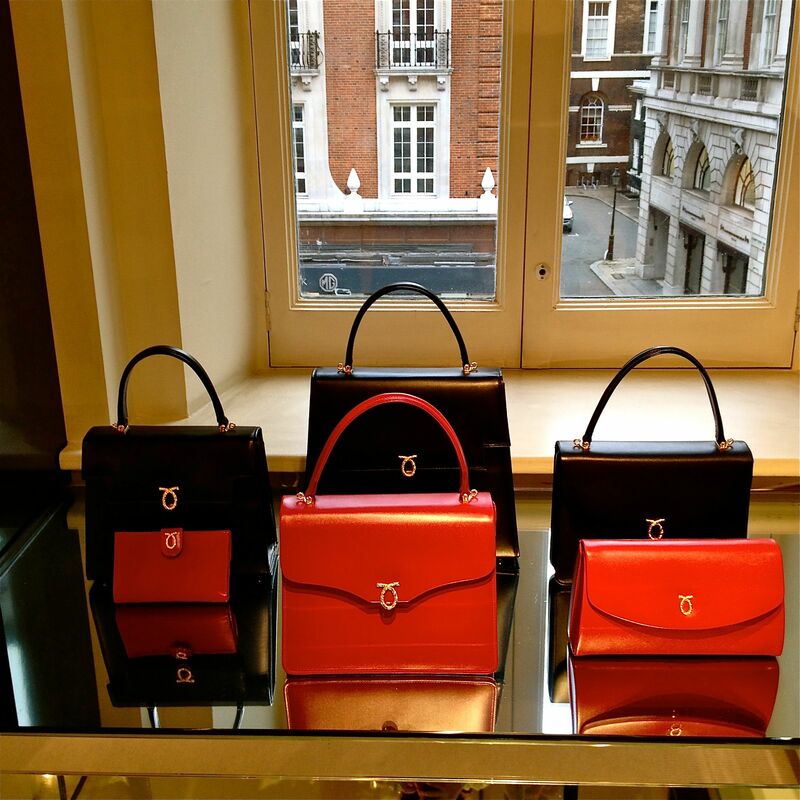 Browsing the handbags, I saw these beautiful purses by Launer and thought they looked familiar. It turns out Queen Elizabeth is a fan! 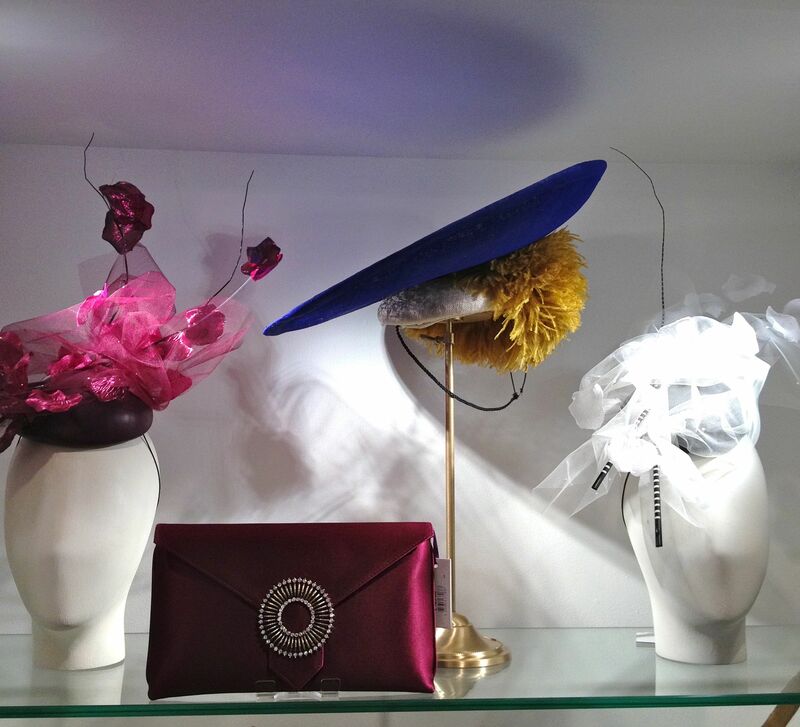 Launer handbags. I wish I took a picture of the two-tone styles – they were my favorite! Eventually, I wandered down to the food hall in the basement, and asked about gin, specifically gin that I would not be able to find in the United States. 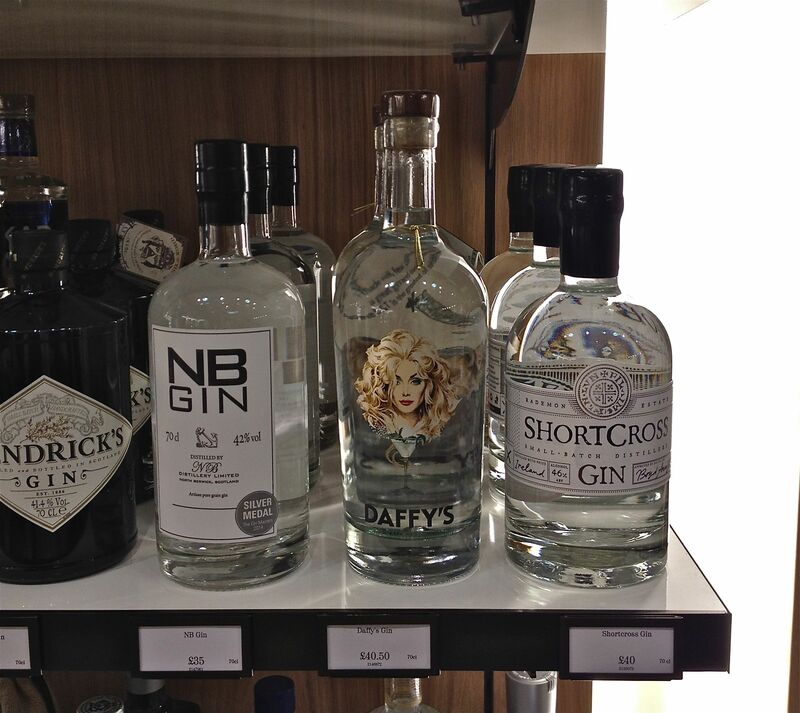 Immediately, the sales clerk suggested Short Cross Gin from Northern Ireland. I had already purchased some Short Cross when I was in Ireland earlier this year, so I asked for additional suggestions (Short Cross is quite good, and I do recommend it!). The sales clerk offered me a taste of some of the gins on offer, and another shopper joined me in sampling the gin. We were tasting different gins and comparing what we thought of each – it was nice to try the gins before purchasing any and to see the subtle differences in each brand. I decided to purchase Hammer & Son Old English Gin – I liked the look of the bottle as it was packaged differently than the other gins. I think it might be available in the United States, but I liked it so why not purchase some when it was right in front of me? 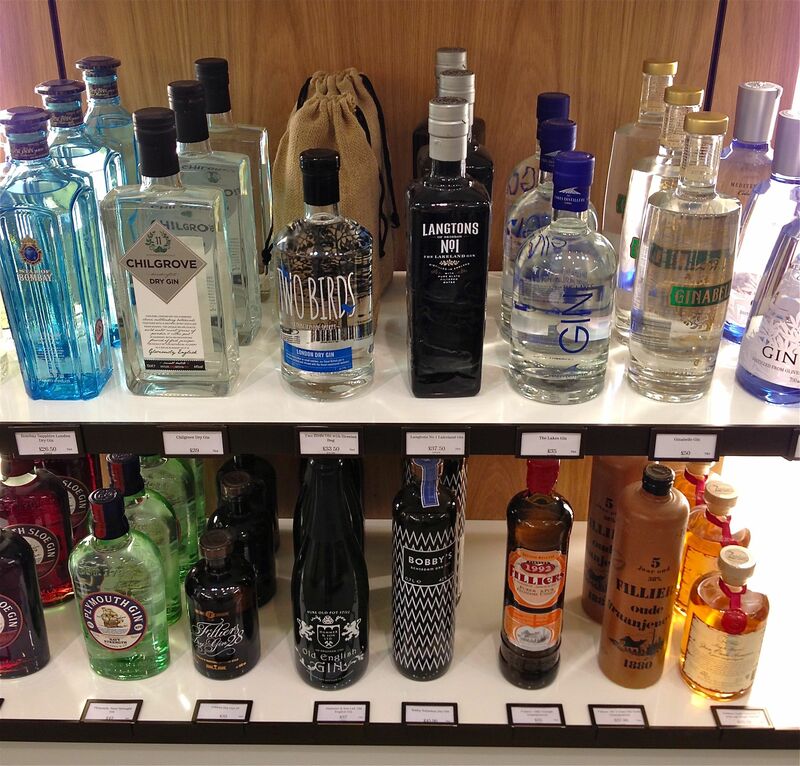 As you can see, there is quite a selection of gin to choose – going to our local liquor stores here do not offer this selection! I saw Plymouth Gin on the bottom shelf here – I purchased some of the Plymouth Sloe Gin when I was at the Plymouth BlackFriars Distillery in April (read about my visit here). 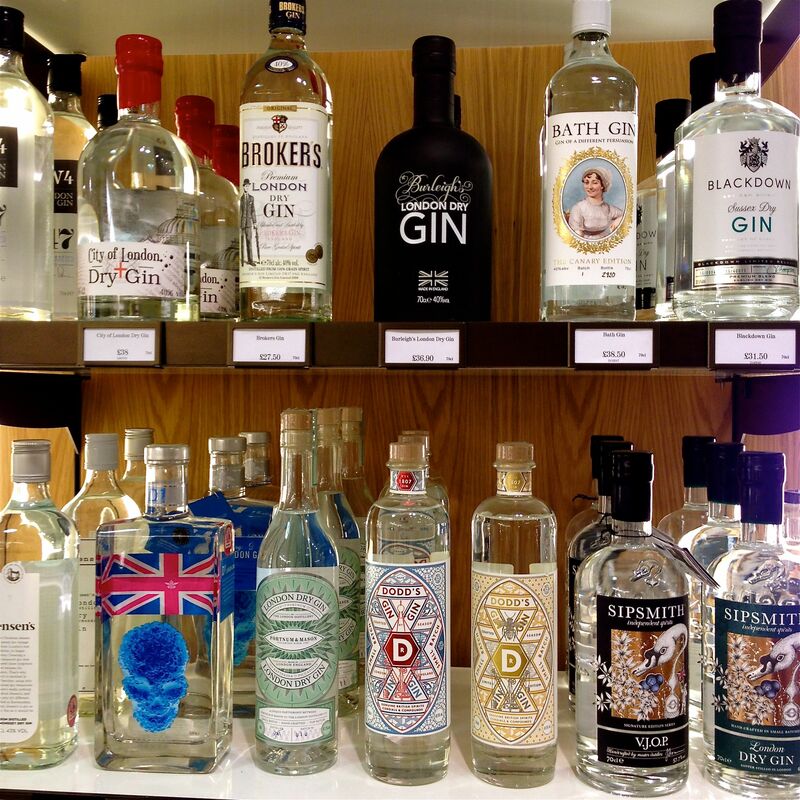 Some of the gin at Fortnum and Mason (the Plymouth Gin and Plymouth Sloe Gin are on the bottom shelf on the left and the Hammer & Son Old English Gin is also on the bottom, fourth from the left). While enjoying the gin samples, the sales clerk asked if we liked whisky – of course we do – and would we like to sample some? We tried some straight, and then he added just a drop or two of water to our cups, which provided a different and deeper taste. We were having quite a lot of fun – soon another couple joined us. 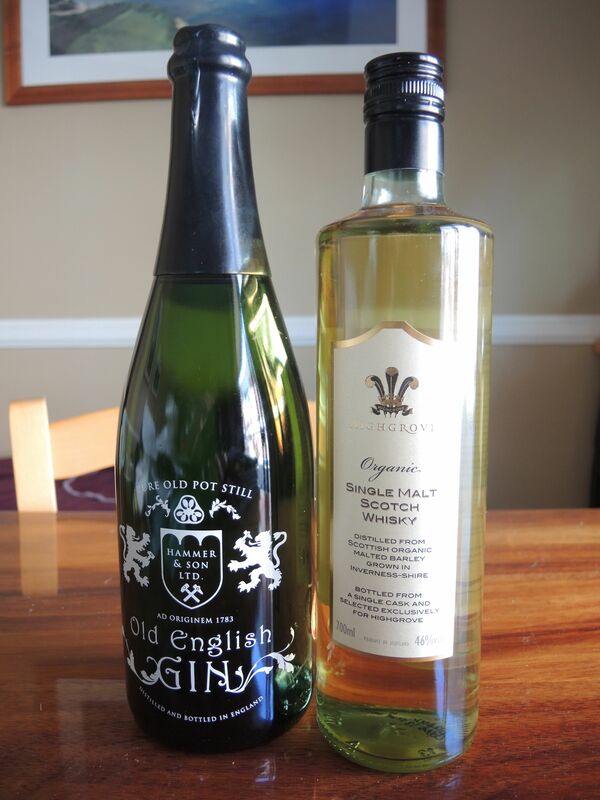 The Highgrove Organic Single Malt Whisky was to my liking, and I purchased a bottle. This single malt whisky was selected and bottled exclusively for Highgrove. The whisky is distilled from Scottish organic malted barley, grown in Inverness-shire and matured in a single, numbered, first-use Bourbon cask. It was closing time at the store, so our tasting came to an end, the clerk wrapped my bottles in Fortnum and Mason tissue and sent us on our way. These bottles made it back to Los Angeles, tightly packed and cushioned in my checked luggage. I have yet to open them but when I do, I will remember the lovely tasting experience at Fortnum and Mason! This entry was posted in Gin, London, Travel Treasures and tagged Gin, GinLover, London, Whisky by Kiera Reilly. Bookmark the permalink. A tasting while in CA in December.